My Kinda Art: X, Y, Z . . .
Hello and welcome! 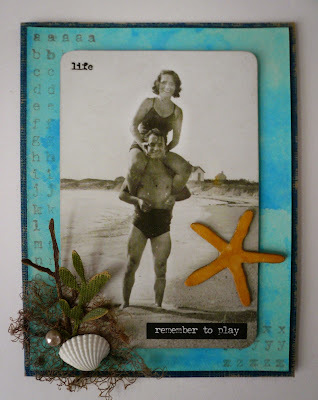 I created today's card for the current challenge over on the Simon Says Stamp Monday Challenge Blog. If you're a fan of Tim Holtz you probably noticed that I used some of his new stuff like the alphabet stamp from the Documented Set. I also used Fossilized Amber Distress Paint to color the starfish. Both were perfect for this challenge. Thanks for stopping by!